The Blonde d'Aquitaine breed originated in the Garonne valley and the Pyrenees mountains area in the Aquitaine district of France. Blondes short smooth hair is usually wheat colored, but can range from almost white to brown. They are known for their lean muscling, high growth rate, docility and calving ease due to a high tail setting, large pelvic area and light bone. The average weight of mature females is 1600-1900 pounds and bulls 2500-2800 pounds. These are big blondes! 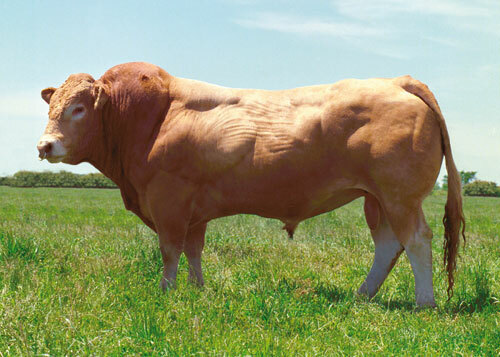 They are the third largest breed in France after the Limousin and Charolais breeds. First imported into the United States in 1972.